I was weaned on a college radio station called KFJC in the San Francisco Bay Area in the early 1980s, a station that had one of the coolest rotations imaginable for the time. Actually I doubt they had a rotation, as I myself was a DJ there later in the 80s & we played whatever we wanted. But the 1980-83 crop of regulars included the GUN CLUB, THE FALL, DOLLY MIXTURE, ANIMALS & MEN, CRAMPS, REVILLOS, GANG OF FOUR, 100 FLOWERS, SIOUXSIE & THE BANSHEES, AU PAIRS, BLACK FLAG, and dozens more I’m forgetting. Not sure if they did “charts” at the time, but I can remember two tracks that I heard so many time they’d have to be near the top – “Cowboys In Africa” and “Snakes Crawl” by New York’s BUSH TETRAS. The Tetras’ funky, limber take on late 70s no wave was pretty radio-friendly for a cross-section of hipsters, since you could probably dance to it in a club (as many in the “Downtown ‘81” scene did) while still classify it to a burgeoning small-press American 45 DIY scene. Their compatriots across the sea were Britain’s Au Pairs and DELTA 5 – three bands with hollow, matter-of-fact female singers either speaking or bellowing over a disjointed, bass-heavy slow rush. 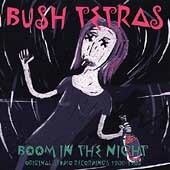 All had their weak tracks, but the Bush Tetras’ collection “Boom In The Night” still holds up well. It contains all of their “Too Many Creeps” and “Rituals” EPs, their 3rd 45 + numerous strident funk numbers laying around from the era. Some have said something about an African influence, but outside of a few horns and tribal percussion, I’d have to call that a “critical reach”. I really dig Cynthia Sley’s disaffected vocals and Pat Place’s choppy noise guitar, and the two tracks from the KFJC days + “Too Many Creeps” are probably the best (“Snakes Crawl” is a little cloying, though). This is a band that I pictured as the living embodiment of “night club” when I was too young to get into one.